Cultivate Michigan is a statewide campaign to help Farm to Institution programs grow. We work toward the Michigan Good Food Charter goal that Michigan institutions source 20% of their food from Michigan sources by the year 2020. With our members and leadership, we select four new seasonal featured foods each year. We promote them with posters, window decals, buying guides, recipe ideas, and tours of farms, and processing, production and distribution facilities. Food service buyers interested in using more Michigan foods at their institutions can sign up for Cultivate Michigan and set up an account. 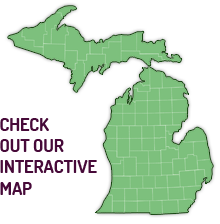 Those who join will complete quarterly surveys about purchases of featured foods and other Michigan foods. This information feeds into each institution’s online dashboard to track purchases of Michigan foods and progress over time. Cultivate Michigan then uses this information to measure and share our statewide impacts and help food service buyers and vendors work together to ensure supply meets demand over time. Cultivate Michigan is a campaign of the Michigan Farm to Institution Network (MFIN), a group of practitioners, supporters and advocates all sharing common goals to help Farm to Institution programs grow. Network membership is available to Farm to Institution practitioners, farmers, food suppliers and vendors, advocates, supporters and researchers. Join us! The Michigan Farm to Institution Network and Cultivate Michigan are coordinated by the Michigan State University (MSU) Center for Regional Food Systems with support from MSU Extension, and a leadership team and advisory committee. The Michigan Farm to Institution Network and Cultivate Michigan are funded, in part, by the W.K. Kellogg Foundation, the Kresge Foundation, and the Americana Foundation.